I can’t help but love the image above. The grey tones of the wainscoting, the almost ethereal wall mural combined with the delicate glass display form such a beautiful harmonious composition. What a great vignette…unfortunately I have no idea what or who the source is. So, I am wondering, are you one of those people who would love to add more personality to your home by adding a floral motif somewhere? You would love to do something different and bold, but you are unsure how to proceed. Join me in exploring a few ways to add something special to the room of your choice. Floral motifs are not really my thing in design. Partly because in the ‘old’ days florals were utterly boring and partly because florals in North America are typically muddy in colour and not particularly attractive. 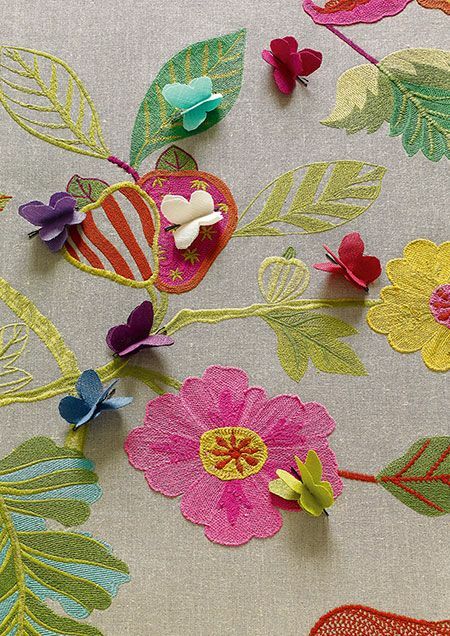 Most of the earlier florals were small prints in upholstery or wall paper. I prefer the European use of colour and graphics in fabrics and wall papers. The colours are fresher and cleaner looking. The graphics are sharper. It must be my European background. I also don’t gravitate to small things, whether small patterns or knick knacks. I like big and bold. That is, I always like it for myself and sometimes I have had a client who felt the same way. Some clients can handle big and bold, most are more moderate or even prefer smaller prints and items. Lately I have developed a strong attraction to florals in striking patterns and colours. Large patterns and graphic representations of flowers are my “new’ thing. Marimekko in Finland really knows how to pull off large and graphic. The company has a number of iconic prints that have been around for decades and are still popular today. 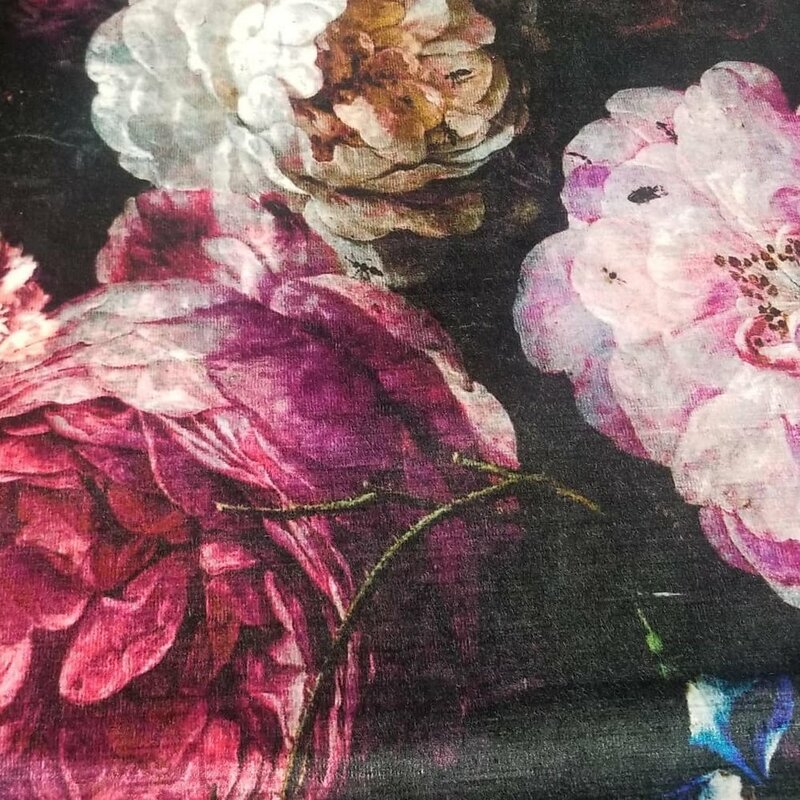 I also feel a strong pull for florals in the Renaissance style. Now that the days are getting shorter and the light fades earlier, having flowers in our spaces can make for an inviting and cheerful environment. Nothing speaks more about daring and adventurous as a single chair upholstered in a gorgeous floral coordinated with a few solid coloured pieces. A bold graphic floral wall paper can add character to an otherwise calm room. Lets take a look at five ways to achieve a more personal and adventurous look for your home using floral and foliage motifs..
An easy and inexpensive way to add character to a space is by hanging wall panels. Take a look at the chinoiserie panels in the photo above. Back in the 17th and 18th centuries when European countries were exploring the world and in particular East Asia, the explorers would bring back gold, silver, spices, teas and silk. As a result Europeans began to interpret and duplicate artistic traditions from these areas in, amongst other things, architecture and interiors. This expression of art is known as in Chinoiserie. The word is derived from the French word ‘chinois’, which means Chinese. What stops you from finding a gorgeous floral piece of textile, mounting it on a board and frame it with a simple frame. I like how the frame in the image is the same colour as the field colour of the piece of textile. The two upholstered, velvet stools really finish the display. A piece like this would look striking in a foyer or as a backdrop for a dining table. 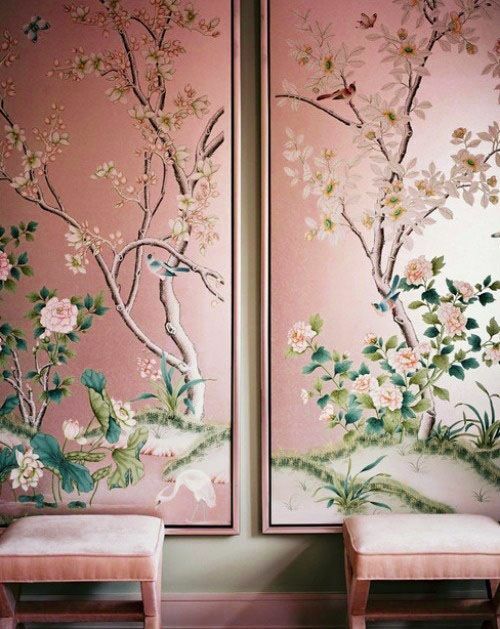 If you don’t care for chinoiserie you could use any other floral design, as long as it has the quality of a piece of art. Consider the placement of the flowers and leaves. Are there any other interesting detailsin the fabric, such as a butterfly or a beetle? Is the scale of the flowers large enough? Find a wallpaper with a large motif showing a flower arrangement by one the Dutch Masters and mount it on a board (even illustration board would work if you can find it in the larger size), then frame and hang it. Another way to create a wall panel is by carefully selecting a a rug with a large floral or foliage motif. A size of 3 feet wide and 5 feet high (a common rug size) would work really well. You can hang it as is. As a wall panel, a rug will not need a frame. The rugs below are by Rugs For All Reasons. The first one has an oriental feeling while the second one is more contemporary in design. Wallpaper has long been a favourite way to add interest to any room. Wall paper was introduced by the Egyptians around 4000 BC. They used papyrus, a fiberous material, to decorate their walls. A few thousand centuries later the Chinese invented actual paper and started to glue rice paper to their walls. Silk panels have adorned the walls of the aristocracy in France for a long time. In the Middle Ages walls were hung full with tapestries made by artisans. These tapestries not only provided a beautiful background for otherwise somber and primitive furniture, it served an important purpose by insulating the walls of castles and manors against the cold. Webster & Company Showroom (US). Isn’t this backdrop just perfect for the sofa and chairs? The pink and green pillows pick up the colours from the wallpaper. As time went on paper panels became more and more an inexpensive way to dress a wall or two. Wallpapers had found their way to the middle classes! Better adhesives were developed. And even self-adhesives papers came onto the market. What stops you from choosing a bold and beautiful wall paper to feature a wall in the living room, a hallway or a bedroom. In the image above the dark and moody paper is punctuated with delicate branches and a bird or two executed in either a silver or gold paint tone. Note how the fragile looking chair coordinates beautifully with the wallpaper motif. The silvery-golden tones are even reflected in the area rug. Source: Surface View Wall Paper Co. In wallpaper motifs the Dutch Masters are becoming quite popular. Enlarged details of a paintings are finding their way into homes in unexpected ways. The famous Rijksmuseum in Amsterdam (home to Rembrandt’s “Night Watch”) has an interactive websites you can sign up for. This allows you to pull any image of art on display or owned by the museum and use it for your own purpose. Check it out. It is really interesting. Of course, there are plenty of Dutch Masters represented in the museum. Take advantage of that! Webster & Company in Boston (USA) is a high end furniture and fabric supplier. They also represent a few wonderful wallpaper lines. Wallpapers which are striking and interesting. Above are two images showing two completely different styles of wall paper from this company, both equally appealing in their own way. Check out their website to find inspiration. People usually make safe decisions when purchasing large pieces of furniture. Most people cannot envision anything other than safe styles and colours in their rooms. In the West Vancouver area of British Columbia that has been beige for the longest time. I respect that although in the case of West Vancouver beige has become utterly boring to me. Large pieces of furniture or a large quantity of furniture represent a lot of money. People want to make sure that they don’t make mistakes when buying these items which have to last for years. Yet, often they unintentionally do just that. Do you have an old chaise somewhere which you could have upholstered in a contemporary fabric like this floral? Choose colours that work with the rest of your decor and you could add a wonderful character piece to your home. One big mistake people often make is purchasing sets of furniture. Think of the matching sofa and lounge chairs, or matching dining chairs. Personality can be given to any room by NOT matching furniture. By purchasing individual pieces which complement one another. This creates the illusion that the homeowner was on a journey to find just that right piece for the room. A much more interesting way of looking at decorating. Don’t you think? Take someone who needs a new sofa. He and/or she sees a model that they like; they like the style, the upholstery and its comfort. Rather than purchasing matching lounge chairs, they could get either one matching chair and get a totally different second chair. This second chair can have a different style and can be upholstered in a patterned fabric such as a floral. If you have a large enough space two sofas or love seats facing one another is also a good option. Then add two chairs in a completely different style and patterned upholstery (on the premise that the sofas/loveseats have a solid coloured fabric) and you have an interesting conversation group. Or, what about the homeowner who just got a new dining table and needs 6 to 8 chairs to work with it. The easiest thing to do would be to purchase the matching chairs. But what if you took a different approach: purchase 4 or 6 that either match the wood of the table or closely coordinate with it. Then use two upholstered chairs, like for instance two small wingbacks, as the host and hostess chairs. Sounds more fun, doesn’t it? 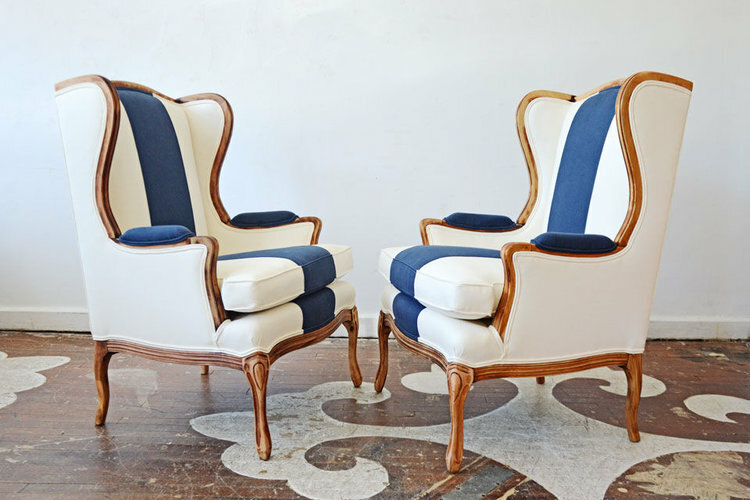 You can then upholster these two chairs in either a great floral or in two different kind of fabrics like a floral teamed with a solid. If you approach a dining room in this way you could introduce three different kind of fabrics! Draperies make a huge statement in a room. For people who have mostly solid colour furniture, adding floral draperies is an easy way to add interest and additional colour to the room. I particularly like floor to ceiling panels. Even for short windows. I do not believe in short drapery panels. A great drape hangs to the floor from about 5-6 inches (10-15 cm) above the window casings. I also like drapes to hang from about 6’ (15 cm) below the ceiling. By choosing tall panels the ceiling will always look higher than it is. This can be a real bonus when you have the standard 8 feet ceilings (3 mtrs) in your home. One thing to think about though is that draperies are never inexpensive. Well, at least the good ones. It has been my experience that after extensive renovations to a client’s home, there was no money left in the budget for good drapes. People do not realize how costly drapes can be. There are many companies, online and in big box locations, which sell drapery panels at very reasonable prices. They have a place in the market for sure. If, however, you want drama or an elegant solution I do not recommend purchasing inexpensive drapery panels. Their quality is not great; they typically come in standard sizes and nearly always need to be altered. For a good set of drapes I refer to specialty stores such as drapery suppliers. They usually have a library of fabrics to choose from; they can custom order, custom fabricate and even have a good selection of rods and finials hardware to choose from. One of my favourite drapery textile designers and manufacturers is Manuel Canovas, a distinguished French textile house. Manuel Canovas fabrics are renowned the world over. The fabrics are of a high quality. The choice of colours is, of course, very European in nature: they are fresh, crisp and vivid. Manuel Canovas fabrics show amazing prints and rich weaves. 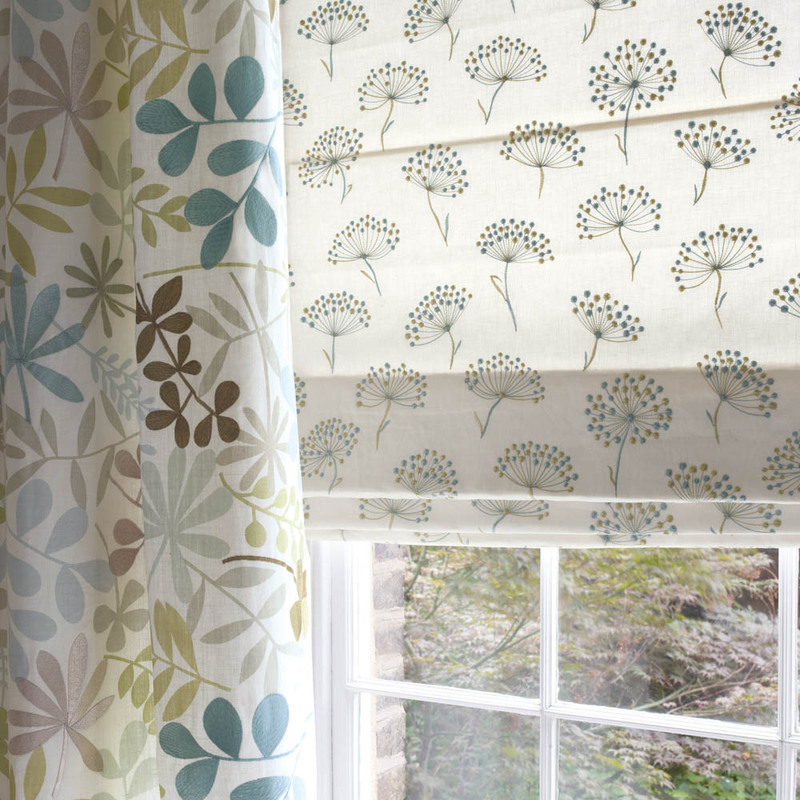 The fabrics are only available through design showrooms open to the design trade. You would need a designer to purchase the materials for you. Here are some gorgeous examples of drapery fabrics. One of the least costly ways to introduce florals in your decor is by using interesting throw pillows. Manuel Canovas - Samira Collection. Don’t you just love the large pillows? Throw pillows will never break the bank and they allow you to change the feel of the room by changing the colours and patterns. You can easily make seasonal or festival related changes. Fun pillows can be found at many decor stores. Great pillows though, like great draperies, are usually custom made. Pillows allow you to follow some cool trends that otherwise you would not do where large furniture purchases are concerned. You can play with textures, patterns and colours. You can add trimmings and other embellishments. They can give you the feel of a custom home! They can enhance an otherwise boring decor. The above image shows fifties style dining chairs with a block table combined with a rustic bench behind it. I know this look will appeal to many people. It is safe. The colours are muted, grey tones and subdued patterns. I would prefer to see the chairs in a bolder colour, perhaps a deep burgundy red or a raspberry red, with a collection of jewel-tones and patterned pillows on the bench. I can so see that! Hope you had fun with all the eye candy! Thanks for visiting.